We have been given to understand that the State Council of Educational Research & Training (SCERT), National Capital Territory, Delhi (NCTD), India, has released the Detailed Notification in respect of Admission into Diploma in Elementary Education (D.El.Ed.) and Early Childhood Caring & Education (E.C.C.E.) at various D.El.Ed. Government recognized District Institutes of Education & Training (DIETs) as well as the Early Childhood Caring & Education (E.C.C.E.) Recognized Private Institutes in the National Capital Territory, Delhi of India during the Academic Year 2019 for the Academic Session 2019 – 2020. Deadline for authentication of the Verification of the Data furnished/submitted in the Online Application Forms by the candidates next day to the Last Date for Online Registration / Online Application Forms by the candidates. Display of Final Acceptance / Rejection of the Candidates within the next week of Authentication / Verification of the input/details incorporated in the Online Application Forms by the candidates. Display within next Three – Four Days of the List of the Candidates Rank wise / DIETs / Institute-wise opted for by the candidates. Display of the Minimum 03 Merit Lists of the Candidates over the next Three Weeks; hence, Reporting of the Candidates recognized by the District Institutes of Education & Training (DIETs) / and other ECCE Recognized Institutes follows. Reporting of the Candidates necessitates them to carry their Educational and all other documents for Verification in Original and Submission / Depositing of the Prescribed Course Fee for Admission at the D.El.Ed. Government and E.C.C.E. recognized Institutes. The release of 4th / 5th Admission List subject to availability of the vacancies. The State Council of Educational Research & Training offers Two (02) Years’ Diploma Course for admission into Diploma in Elementary Education (D.El.Ed.) and Early Childhood Caring & Education (E.C.C.E.) Courses at the District Institutes of Education & Training and Private Institutes affiliated thereto (State Council of Educational Research & Training) as detailed in the subsequent Paragraphs. i) D.El.Ed Government District Institutes of Education & Training (09 No. ); ii) D.El.Ed Recognized Institutes (22 Nos.) and iii) ECCE Recognized Institutes (29 Nos.). Institute-wise / Rank-wise List of the Candidates for D.El.Ed. Course in 09 Government District Institutes of Education & Training (DIETs). Institute-wise/Category-wise / Rank-wise List of the Candidates for Diploma in Elementary Education (D.El.Ed.) Course in 09 Government District Institutes of Education & Training (DIETs). Institute-wise / Rank-wise List of the Candidates for Diploma in Elementary Education (D.El.Ed.) Course in 31 Private Institutes. Institute-wise / Category-wise / Rank-wise List of the Candidates for Diploma in Elementary Education (D.El.Ed.) Course in 31 Private Institutes. Institute-wise / Rank-wise List of the Candidates for Early Childhood Caring & Education (ECCE) Course in 29 Private Institutes. Institute-wise / Category-wise / Rank-wise List of the Candidates for Early Childhood Caring & Education (E.C.C.E.) Course in 29 Private Institutes. 10% Seats of the sanctioned Intake of each of the Institute conducted the Diploma in Elementary Education (D.El.Ed.) Course and/or Early Childhood Caring & Education (ECCE) Course shall be reserved as “Management Quota” to be filled from amongst the candidates as per the Merit List. 10% of the sanctioned Seats allocated, as “Management Quota” would be a part of 85% Seats allocated for National Capital Territory, Delhi (NCTD) / Delhi Domiciled Candidates and 15% Seats allocated for Domiciles other than the National Capital Territory, Delhi (All Delhi). In the case of non-availability of a Digital Photograph / Signature, then the candidates need to visit in person along with Passport size Photo / Signature at the Facilitation Center. Online submission of part admission fee of Rs.1800/-(non-refundable). Reporting of candidate at allotted DIET/Institute along with original documents and remaining fee (the status of reporting to be updated by DIET/Institute through online admission portal/interface of DIET/Institute. Cash Deposit through Computerized Pay-in-Slip at all the Branches of Canara Bank. Payment Status will be reflected after two (02) days. Click here for Online Registration / Online Application Forms. Sir mera 6th list m bhi name ni aaya h tu ab m kiya kro plz tell me plz help me sir…. Dear Nisha, When spot counseling commence then we will inform you at here. Dear Bhavana Bansiwal, Delhi JBT 2019-20 application form is going to issue later. For more reference please regularly visit on this web portal. Dear Bhavana, Delhi JBT Online application form schedule will be released later on its official web page. Sir please tell me how to participate in next round without freezing, i have done my documents verification at my 1st centre alloted…???? Sir,kya iss saal govt diet colleges or private diet colleges ke liye eek he form fill krna pdega yaa phir alag alag??? Dear Nisha Tiwari, Yes you can apply for the jbt form till 12th July 2018 because online application is already started. Sir deled bnd horha h qa next year se??? Dear nisha Verma, Don;t confused because SCERT JBT form will be displayed later on the website. Till then keep waiting. Sir when will informs release?? Dear Shivani, SCERT delhi JBT form is likely to commence soon through the official website. Sir when will be the jbt forms release? When r the admission going to start? N for private n govnt do I have to fill separate forms? Kindly reply? Dear Tannu, Delhi JBT application form is likely to display soon. Sir my D.O.B is 14/05/1994… Am I eligible to take admission in Delhi D.el.ed? Nd is there any registration process too before filling d admission form? ear Kanchan Sinha, Yes you are eligible to take admission in Delhi Scert D.El.Ed and there is no registration process before filling admission form. Thanku sir for the information…but from admission will start? Dear Kanchan Sinha, The SCERT Delhi has not yet issued the application form dates so, till then keep waiting here. Dear Ekta, Why you are confused and you need to keep some patience. The Delhi JBT form is likely to issue soon through the official website. Sir today is 30june . Last year till date the forms had realised .Please tell me when the forms are going to open. Dear Ekta, delhi SCert will take time to release JBT form so, till then please keep stay with us. Dear Nisha, We will shortly notify you when SCERT Delhi JBT form release on the website. I have got 77.8 marks in 12th . I want to get addmision in government diet. Dear Shona, Yes your admission can be possible so, don’t take tension about that. Dear Ekta, Your admission in JBT Course can be confirmed. So, till then keep patience and please wait for JBT Delhi online application form 2018-20, when it display on the website then you may submit your application form. Dear Nisha, We will inform you when SCERT Delhi JBT form release on the official website. For more details please keep in touch with us. Dear Nisha Verma, When NCERT Delhi JBT admission form 2018 issued on the website then we will inform you. Dear Nisha, The SCERT Delhi JBT 2018 form is going to commence shortly through the official website. Dear Mahipal Yadav, We don;t know about that but you don’t loose hope because your admission can be confirmed on basis of seat availability in JBT course. Dear Nisha Verma, The Department will soon notify the SCERT Delhi JBT admission 2018 process through the official website. Further updates will be issued soon. Kab niklega jbt ka form ??? Or uski website kya h????? Dear pawan, We will soon notify you information regarding Delhi JBT 2018-19 online application form at this web page. Jbt takes entrence exam or not ??? Dear Samreen, The last date of JBT Delhi admission is going to notify soon and you are eligible for JBT course. There is no entrance examination for JBT course. Dear Nisha, Delhi JBT 2018 application form will be displayed soon and admission will be done through entrance test. Dear Gulbahar, Selection of the candidates will be done on the basis of merit list only. There is no entrance test. Dear Deepika, You may apply for the D.El.Ed course. I have scored 58% marks in my 10+2…can I get admission in above course…. Dear Manisha, Please visit to the official notification of JBT 2018-2020 notification. when will jbt session start? from which date? I have completed 12th this year with 64% marks. Can I get Admission in the Above courses. Please provide basic eligibility criteria. Jiske pass Domicile certificate nahi hai uska Admission nahi hoga kya ??? sir..bhawna here…actually i scored 81.6% in 12 th with commerce stream…can i get admsn in govtt DIET?? Sir mere 12th me 82% hai kya mera diet ke government college me admission ho payega? Sir/mam scert ki official website coming soon show kr rahi hai?? ?form kb tk issue ho rahe hai diet ke??? sir plz tell??????? Dear Karan, Online Application For Admission 2017 For D.El.Ed. and DPSE will Commence From 20/06/2017 to 05/07/2017. Dear Shivani, Online Application For Admission 2017 For D.El.Ed. and DPSE will Commence From 20/06/2017 to 05/07/2017. sir kya diet k form aa gye ? Dear Akash, Online Application For Admission 2017 For D.El.Ed. and DPSE will Commence From 20/06/2017 to 05/07/2017. Respected mam/sir, I have passed 12th in 2015 with 76.68%. I have no domicile certificate but I applied for domicile certificate so Mam can I apply for JBT . And mam plz tell me when jbt online application form declared and last date for application form. Dear Mennakshi, Online Application For Admission 2017 For D.El.Ed. and DPSE will Commence From 20/06/2017 to 05/07/2017. Dear Himani, Online Application For Admission 2017 For D.El.Ed. and DPSE will Commence From 20/06/2017 to 05/07/2017. Dear Akash, Delhi JBT Application Form will be available soon on the website. stay tuned with us for further updates. sir diet k form kb tk aayenge? Dear Nitin, Yes You can apply. 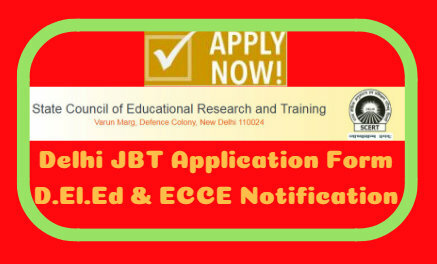 Delhi JBT Application Form will be available soon on the website. stay tuned with us for further updates. Dear Harneet Kaur, Delhi JBT Application Form will be available soon on the website. stay tuned with us for further updates. Dear Harneet, Online Application For Admission 2017 For D.El.Ed. and DPSE will Commence From 20/06/2017 to 05/07/2017. Dear Akash, Delhi JBT Application Form 2017-19 will be available soon on the website of SCERT Delhi. Stay tuned with us for further updates. Dear Mittali, Delhi JBT Application Form 2017-19 will be available soon on the website of SCERT Delhi. Stay tuned with us for further updates. Bro i have 65.8 % all over and 72 % in best four can i get addmision in diet?? Dear Sweta, Delhi JBT Application Form 2017-19 will be available soon on the website of SCERT Delhi. Stay tuned with us for further updates. Can u plz furnish me with the details of DIET delhi admission criteria such as how to fill up the form, what is the official website if DIET, In which website the forms are to be filled as so on.. I got 94% in my 12th cbse board examination. If possible, plz mail me with all the details .. Waiting for a reply. for official website go to http://delhi.gov.in/wps/wcm/connect/doit_scert/Scert+Delhi/Home/. and form will be available soon and u hv great marks???????? Hay I am Manish From Rajasthan belong to ST category and having 76% in 10+2 Secondary Board of Rajasthan. I want apply for JBT from Delhi. Whether my admission possible or not? Dear Riya, The Minimum Qualification for the JBT Course is 12th Class. Mujhe elementary teacher banna h or jbt krna h but mujhe iske bare mai kuch ni pta so pls tell me about it. Dear Vikky, You may visit the website of these Universities. Hope this will help you. 1st cut off will be around 89% for general. and it is just a idea. Mere 12th mi 83.50% h mujhe d. El. Ed mi admi… Lena h… To ky mera ho skta h?? D. El. Ed mi entrance hote h ki ni?? Dear Sweta, Yes You are eligible for Delhi JBT Admission. Kindly Check the eligibility criteria before applying for the application form. the Stay tuned with us for further updates. Plz sir tell me what process to fill the form.? For jbt. I want to admission in JBT ..
but mene registration nhi kya h or last b nikal gai h ..
no exm only merit 12 base…….